I can't find any reference to the town of Vretsia on the internet. I am shortly visiting family in Peyia, Nr Paphos and would love to find the Venetian bridges, particulary Roudias and Skarfos while on holiday. I have found your website very useful but wondered if you are able to help me at all find these bridges. Many thanks for any assistance you are able to give. Thank you so much Helen for your reply and detail in helping me to find these bridges. Skarfos bridge is the easiest venetian bridge to find first when coming from Peyia. From Peyia, drive to Kathikas and from there take the E711 to Stroumpi. At the T junction turm left towards Polis and after Gioulou, take the RIGHT turn (E712) signposted to Simou/Lasa/Fyti. Half way up the hill towards Simou, look out for a sign to Skarfos bridge and follow it down to the bottom of the valley where you will find the bridge. Skarfos bridge is small and only part of the original bridge remains as opposed to Roudias bridge which is spectacular in comparison (see the picture I attached to your question). 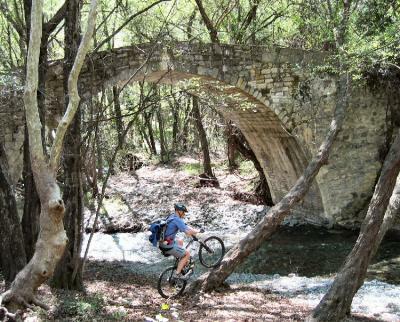 As you have said, the easiest way to reach Roudias bridge is via the small deserted village of Vretsia. To get to Vretsia, you need to look for Pano Panagia on the map (see the Pafos area map). If approaching Panagia from Paphos on the E606 road, you will see a sign to Statos Ayios Fotios. Turn right into Statos off the E606 and follow the outskirts of the village until you see the sign to Koilineia. Go downhill towards Koilineia and as you enter the village, look out for the sharp turn left to Vretsia. The road has recently been improved but after 2km of concrete you will hit a dirt track so a 4x4 vehicle is preferrable. Once in Vretsia, you need to follow the road through the village and steeply downhill until you reach Roudias bridge. Warning - do not attempt the journey in rainy weather as the terrain is very steep to the valley floor. You also have to cross the Xeros river in three places before you reach Roudias bridge so you DEFINATELY need a 4x4 vehicle. If you are feeling really brave, you can carry on past Roudias bridge towards Kelefos bridge and then Elaia bridge but even in a 4x4 vehicle this will take several hours and it is easy to get lost as there are no road markings and lots of junctions! Have fun and please share your own pictures once you get there!